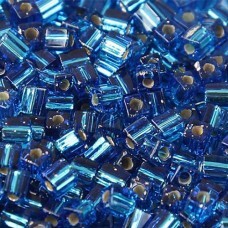 A bulk 100 gram bag of Miyuki 3mm cubes in Sapphire Transparent Silver Lined - Miyuki colour code 0019. These beads are precision made. Also available in a wide range of other colours, and in 1.8mm and 4mm sizes.